Question: What is power brake service and why do Gainesville drivers need to have it done? Of course it's the water squirting out of the syringe. That's because you pressurized the water. Your power brake system is kind of the same thing. When you step on the brake pedal, the master cylinder pressurizes brake fluid which actuates the brakes so you can stop. Gainesville drivers who don't have enough pressure can't stop. A leak in your brake system would reduce – or even eliminate – your stopping power. 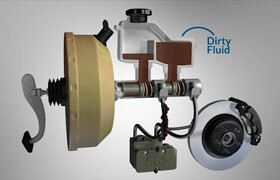 Brake fluid attracts moisture which can cause leak-inducing corrosion. So a great way for Gainesville drivers to keep their brake fluid free of contaminants is to change it as recommended. Enough brake fluid is needed for the proper function of anti-lock brakes, traction control and stability control systems. Your friendly and knowledgeable pros at Jerry's A/C & Auto Repair will check your brake fluid level during a full-service oil change. If it's low it may indicate that a thorough brake inspection is advisable. Low brake fluid is most caused by worn brake pads. Some of the signs of a leak are reduced stopping power and spongy or hard pedal feel. If you suspect a problem, come into Jerry's A/C & Auto Repair for a brake inspection right away.